Note: As of March 1 2019, this application is no longer supported. 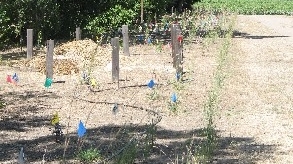 Please use the Calflora Planting Guide instead -- it has the latest and best information. Best Plants, Best Practices is a website that offers advice about how to use plants for conservation land management practices. The site is designed for is for agricultural professionals, landscapers, gardeners, and suburban homeowners. It is a collaborative project of the Napa County Resource Conservation District and the Calflora Database, and relies on data from NRCS California. This site is all about using plants to achieve specific agricultural or landscaping goals. Each button below will take you to a search tool. Click the first button to build a plant list based on your conservation planting needs. This project was funded by a Conservation Innovation Grant from NRCS California, with matching funds provided by the Calflora Database, the Napa RCD, the Napa Sustainable Winegrowing Group, and the California Department of Conservation.